The two superpowers went head-to-head in a worldwide survey, recently published by the Pew Research Center. Comparisons in the survey included perceptions of global image, world power, ways of doing business, popular culture, political views, individual rights, science and military threat, among others. China’s economic power is on the rise, and many think it will eventually supplant the United States as the world’s dominant superpower. Overall, the U.S. enjoys a stronger global image than China. Globally, people are more likely to consider the U.S. a partner to their country than to see China in this way, although relatively few think of either nation as an enemy. The military power of both nations worries many. China’s growing military strength is viewed with trepidation in neighboring Japan, South Korea, Australia and the Philippines. Meanwhile, the Obama administration’s use of drone strikes faces broad opposition – half or more in 31 of 39 countries disapprove of U.S. drone attacks against extremist groups. Across the nations surveyed, a median of 70% say the American government respects the personal freedoms of its people. In contrast, a median of only 36% say this about China. In Europe, the U.S. gets mostly positive ratings. President Barack Obama has been consistently popular among Europeans, and since he took office in 2009, Obama’s popularity has given America’s image a significant boost in the region. European perceptions of China are much less positive – among the eight European Union nations polled, Greece is the only one in which a majority expresses a favorable view of China. Moreover, ratings for China have declined significantly over the last two years in a number of EU countries, including Britain, France, Poland and Spain. America’s image is the most negative in parts of the Muslim world, especially Pakistan (11% favorable), Jordan (14%), Egypt (16%), and the Palestinian territories (16%). Only 21% of Turks see the U.S. positively, although this is actually a slight improvement from last year’s 15%. But the Muslim world is hardly monolithic, and America receives largely positive ratings in predominantly Muslim nations such as Senegal in West Africa and Indonesia and Malaysia in Southeast Asia. Elsewhere in the Asia/Pacific region, the U.S. receives particularly favorable reviews in the Philippines, South Korea and Japan. Chinese investment in Latin America and sub-Saharan Africa has increased significantly over the past decade, and views toward China are largely positive in both regions. Attitudes toward the U.S. also tend to be favorable, and overall the U.S. receives slightly higher ratings than China in in Latin America and sub-Saharan Africa. Just 37% of Americans express a positive view of China, down from 51% two years ago. Similarly, ratings for the U.S. have plummeted in China – in a 2010 poll conducted a few months after a visit to China by President Obama, 58% had a favorable impression of the U.S., compared with 40% today. Young people in both countries express more positive attitudes about the other, a finding that is part of a broader pattern – in many countries, both the U.S. and China receive more favorable marks from people under age 30. *Note: Survey conclusions above are quoted verbatim to avoid external interpretation of the results. The report above is shared courtesy of Ray Hays, Member of Arizona District Export Council. Is Franchising the Last Bastion of American Business Leadership? A new Entrepreneur Magazine article studies this new trend, some examples of foreign franchisors in the U.S. market, and the barriers to entry to for international franchises wishing to launch into the U.S. market. The article quotes Ray Hays, author of this blog, in addition to franchise owners involved in this trend. 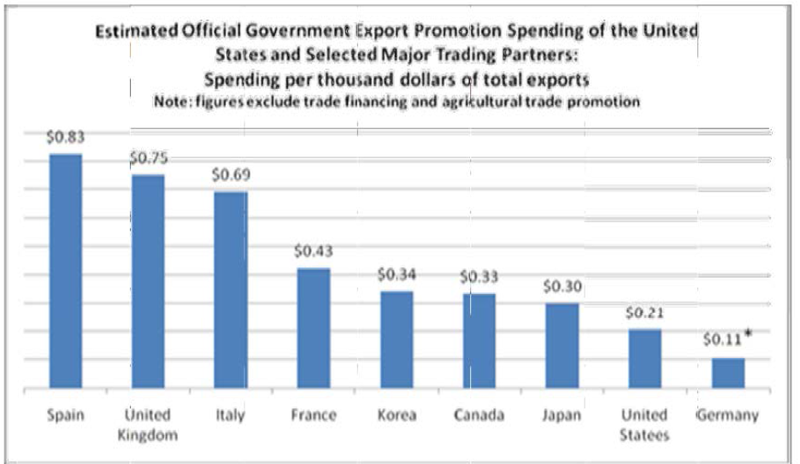 How does the U.S. Federal Export Promotion Stack Up to Other Exporting Countries? Re-blogged from the National District Export Council website www.districtexportcouncil.com. On February 28, 2013, Daniel Ogden, Chairman of the National District Export Council, testified before Congress during a hearing of the House Small Business Trade Subcommittee on the development by the 113th Congress of a small business trade agenda. The UK’s Passport to Export program for SMEs provides free one-on-one mentoring, subsidized training, and a subsidized visit to an overseas market. Germany provides support to firms exhibiting in trade fairs abroad. 60 percent of all German firms participate in trade fairs; two thirds of which exhibit abroad. France’s Trade Missions Overseas program provides up to $3,750 to SMEs and includes French pavilions at trade fairs, products and displays, and other t trade promotions. The Netherlands and Australia have grant programs that pay (up to $110,000 in the Netherlands) for new exporters’ market development costs. For more information on the National District Export Council, please refer to their website at http://www.districtexportcouncil.com. Branding: Where China falls short. Few would dispute that China is a formidable competitor in the global arena. The growth of the trade deficit between the U.S. and China is a testimony to China’s success. In the last two decades, the U.S.-China trade deficit ballooned from $10 billion to $273 billion. Toys to televisions, few U.S. or European manufacturers can compete with the economic advantages of Chinese production and labor. Yet in the global economy, China has a competitive weakness that sits in plain sight: brand equity. Name one brand of American automobile. Name one brand of American computer. Name one brand of American aircraft. Name one brand of American software. Name one brand of American clothing. Name one brand of Chinese automobile. Name one brand of Chinese computer. Name one brand of Chinese aircraft. Name one brand of Chinese software. Name one brand of Chinese clothing. How did you do? Unless you are Chinese, (and maybe even if you are Chinese), the second quiz is much more difficult, correct? Now, expand this list to most branded products… Unless you’re thinking of martial arts superstars or very long walls, China simply falls short on brand recognition. If you are from Asia, you may know several Chinese brands, but on the global stage, China has failed to become a true brand competitor. 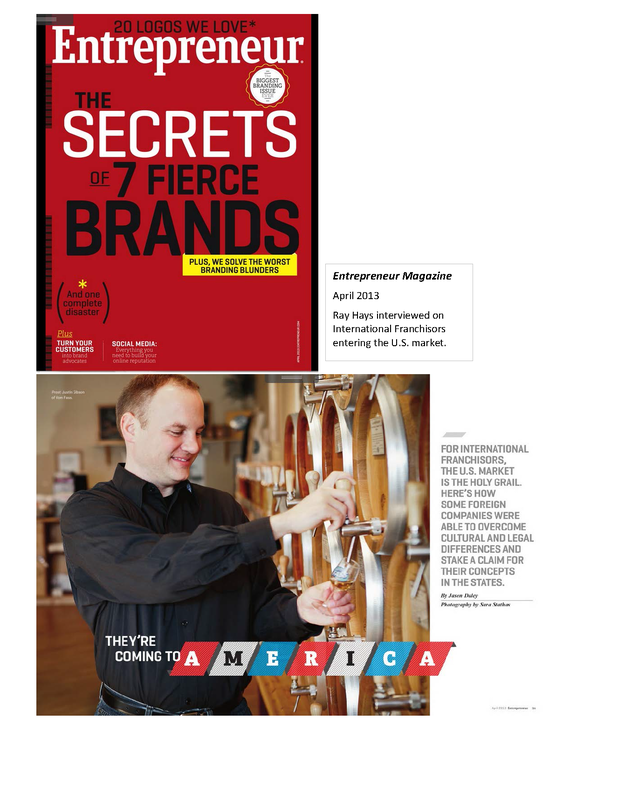 Successful branding is one of the reasons why American brands sell so well. Of course, Japan, Germany, France and other countries have great brands… Sony, BMW, Christian Dior. However, I would argue that in today’s global market United States is still the world’s powerhouse of branded products. Right now, I’m in my office looking at two computer screens, with the brand names of Dell and Magnavox, a printer branded HP, a wireless router branded Cisco… Yes, I know what you are thinking: Then I look at the little label on the back, and yes, every single one of these items is “Made in China.” All of these products are Chinese-made, but they are American-branded. So are they Chinese products or American products? How much value does the American brand really add to the product? Ask yourself, as a consumer from the U.S., Europe, Latin America, etc… Would you rather purchase a wireless router branded Huawei or Cisco? Never heard of Huawei? It’s the largest brand of computer router in China… and yes, many tech people might know and trust this brand, but not the average American or European consumer. Which router would you buy? I’d guess 95% of you would buy the Cisco router. Okay, the sales person offers to reduce the price of the Huawei router by 10%. Would you buy it now? Okay, 20% off the Huawei router. Would you buy it now? Eventually, a typical American or European consumer might consider the Huawei router… but at what discount? In short, the difference in selling price represents brand value or brand equity of the competing products. Brand is a matter of marketing. Brand is a matter of perception. Brand is a matter of purchasing decisions. Brand is a matter of global competition. In this regard, China is far behind the U.S., Europe and Japan. While American and European companies rely on inexpensive Chinese labor to produce our products, China relies on American and European brands to sell the products. Where would Chinese manufacturing be today without American or European brands? In the future, will Chinese-branded products gain wide acceptance on the global market? How can Americans and Europeans leverage their current branding advantage to better compete with China? To be clear, I believe that China is a very respectable competitor in global trade. I believe that China produces some of the world’s finest products. (My mother only brought out the fine china porcelain plates on special occasions.) For many centuries, the Chinese demonstrated leadership in global commerce, long before the rise of large-scale European or American foreign trade. 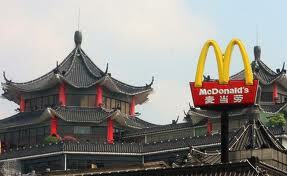 That said, if China wishes to truly dominate today’s world economy, it must first win the global battle of the brands. This will be a tough battle indeed. For more information on Ray Hays’ professional background and international business consulting services, click here.